The majority of wildlife viewing safaris undertaken by visitors to Tanzania aim to see as much varied wildlife as possible. 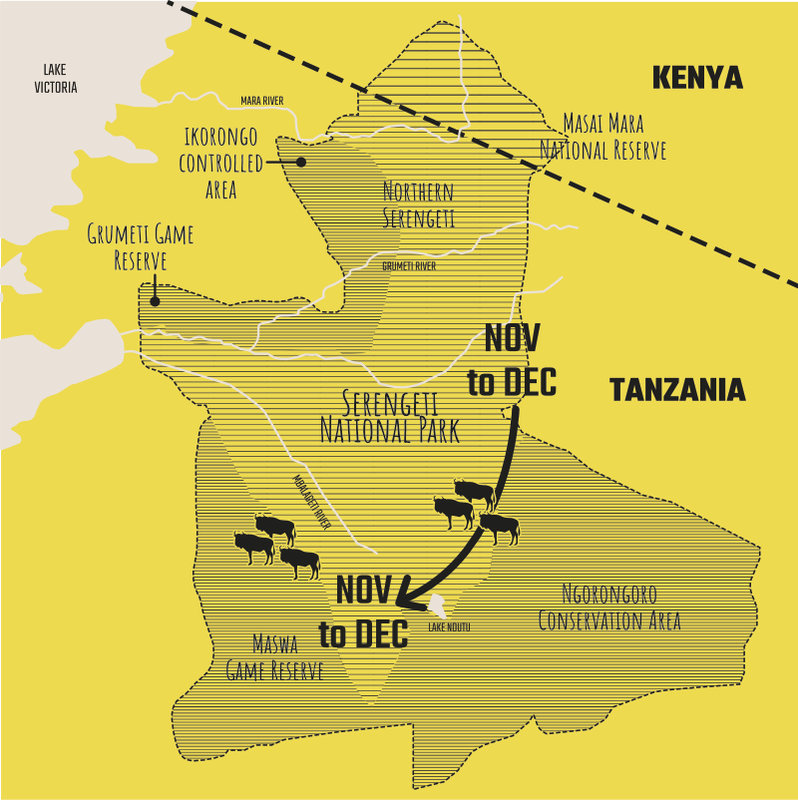 Before planning a safari then, it's helpful to have an idea of wildlife movements. 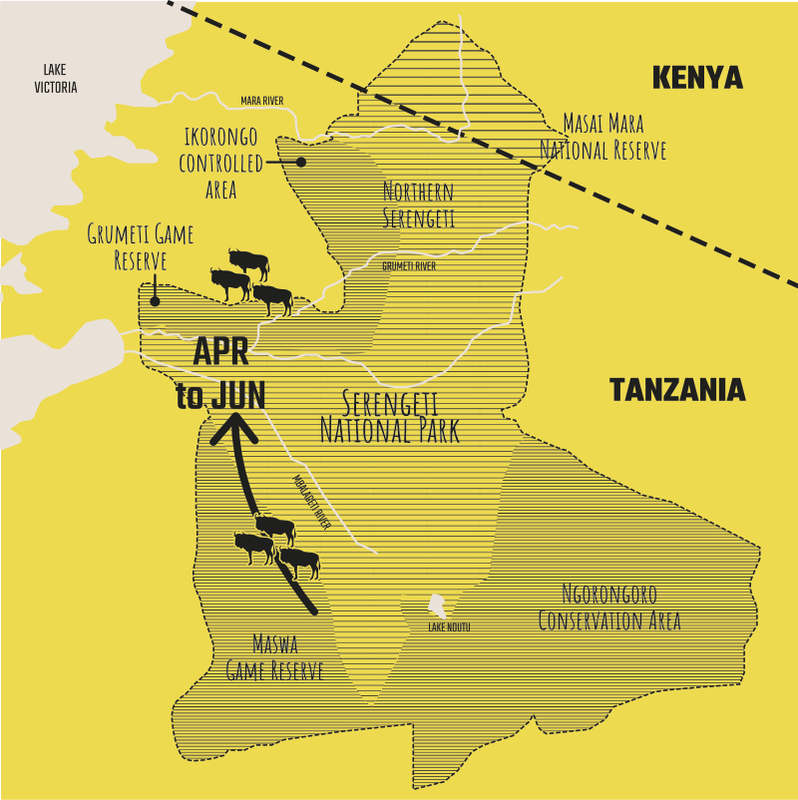 It is a well-established phenomenon in Tanzania that broadly speaking, where one may expect to find game is closely connected to where we find the Wildebeest Migration throughout the year. This is because predators gravitate towards dense wildebeest populations to facilitate predation, and herbivores will move towards where the grazing is best, and of course this criterion is the primary driver for the wildebeest themselves. 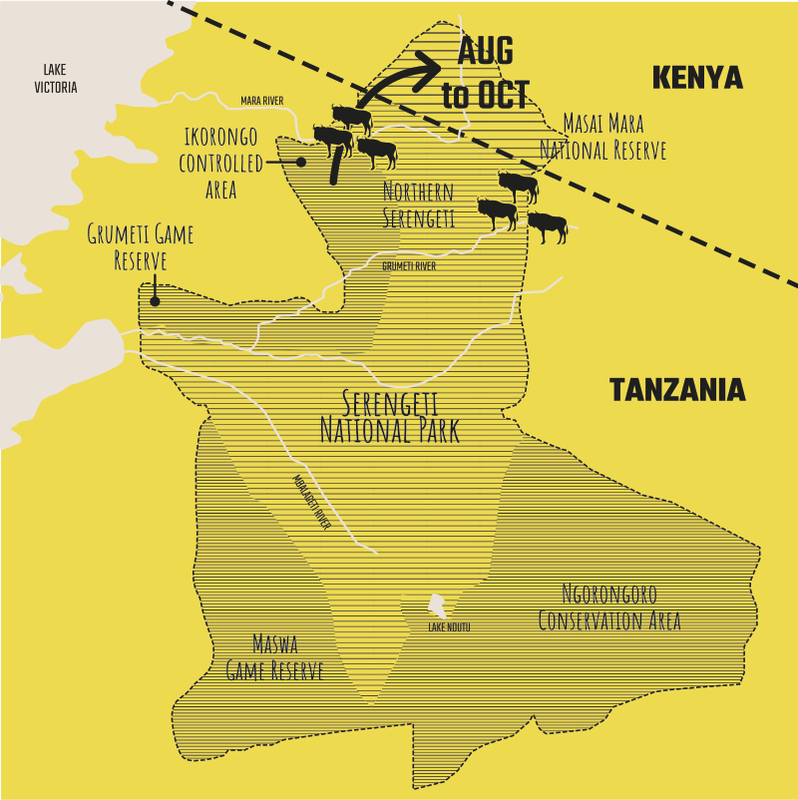 This diagram demonstrates, very approximately, where we would expect to find the Wildebeest Migration throughout the year, so when requesting specific national parks and conservation areas to be included within your safari itinerary, please bear these movements in mind. Alternatively, just let your coordinator know what kind of expectations you have for your safari - maximum game sightings; avoidance of crowds of other visitors; incorporating a cultural or adventurous element that gets you out of the vehicle - and let your coordinator propose a customised itinerary to you that they believe will provide you with the greatest satisfaction. 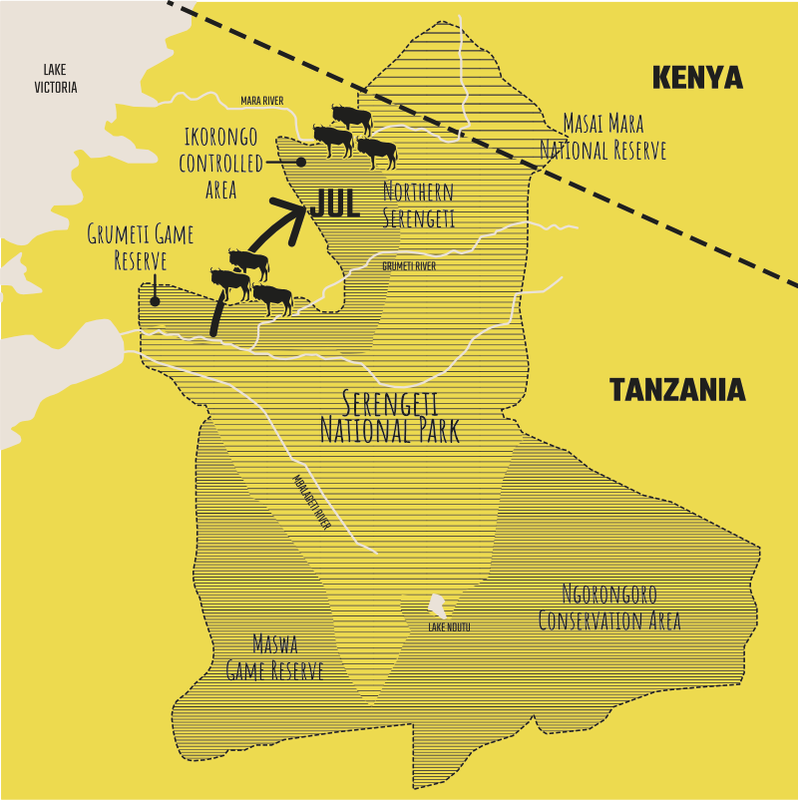 Visit our dedicated Tanzania Safari website. 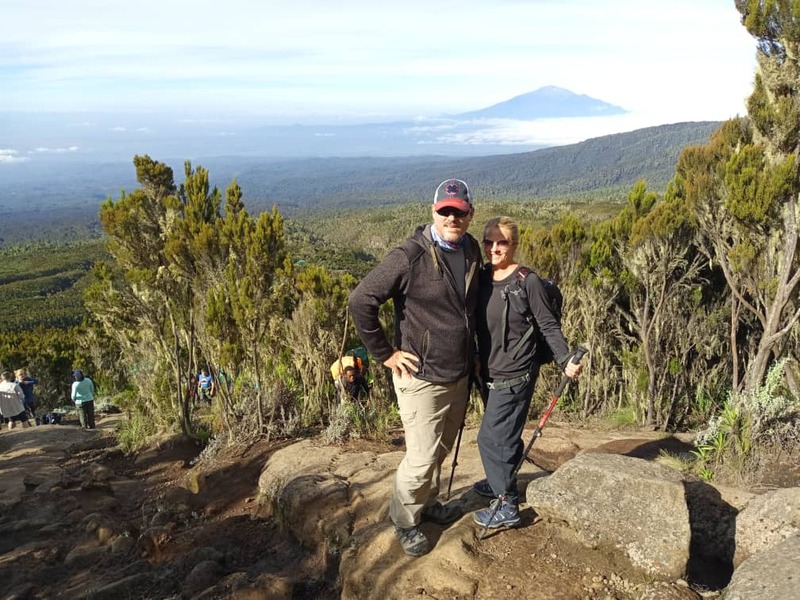 While some half of our climbers request to go on safari with us following their climbs, perhaps a third part of our climbers will make their way to Zanzibar for a few days, so as to end their Tanzanian vacation with well-deserved rest in a tropical island idyll. In response to this growing demand, we have spent the last few years developing excellent relationships with forty of what we believe represent the best of what Zanzibar’s accommodation providers. In contrast with much of the grandiloquent praise that is the usual character of such informational resources which aim to encourage visitors to these parts, our intention in providing this new website has been to offer candid and neutral insights into what might be expected at the various options that we would be delighted to arrange for our climbers. Visit our dedicated Zanzibar Island Hotels website. While couples and larger groups will usually keep their safaris private, a number of our safari-goers are happy to open up their booked dates to others to join. The advantage of joining a safari that's already scheduled is that if you are willing to liaise with the person who booked the safari with us directly, everyone enjoys the same safari at lower cost, and sometimes it's interesting to share the experience with others - particularly if you're travelling to Tanzania alone. Browse through our available dates (those not marked "Private") and feel free to drop us a line if you'd like us to give you details of any of the itineraries or connect you with the rest of the booked group. Interested to know what other climbers ask us?